Everyone wants to know what the future has in store for us. Most people just wait and see. But in direct marketing, we can often accurately predict the response rate, based on past customer behavior. The result can be greater efficiency of marketing dollars. Our company has been maintaining a customer marketing database and providing marketing support to a major truck manufacturer for several years. As a result we have built up a wealth of detail from past marketing efforts. We use this information to predict what will happen when we do the next promotion to prospects and customers. Last year, we did a promotion to 5,644 truck prospects and customers. Before we began, we used a model to predict our results. Vocation: eg landscaping, electrical contractor, towing, etc. While we were convinced that our method was accurate, we still had to convince the manufacturer to use the model scores to guide his marketing efforts. The test promotion to 5,644 prospects was used to prove the validity of our efforts. There was a lot riding on the outcome of this test both for us and for the manufacturer. The trucks cost an average of $33,000 each. The truck manufacturer was hoping to convert 1.5% of the 5,644 prospects into truck buyers or 85 trucks. We thought that we could do better, using the results of our model. To sell the trucks, we developed a creative package that explained new truck features that had been developed in 1999, but had not been advertised widely. Using the scoring system, we sent an offer, with an incentive plus a survey to three equal groups plus a control group. Of the four groups, the control group was probably the most important. It represented truck sales which occur in the absence of any direct marketing offer. The 520 companies in the control group were selected equally from those prospects scoring high, medium and low on the sales probability model. The use of a control group answers the perennial naysayer, who says, “These companies would have bought trucks anyway without the direct mail. You wasted our money.” As you can see, the chart shows that without encouragement, one half of one percent of our selected prospects would have purchased a truck. All of our three groups did better than that. In total, the campaign produced total sales of approximately $5,280,000. The program cost $80,000 which meant that it cost $500 to sell each truck. In the industry, the selling cost of a truck (excusive of commissions) is more than $1,000, so, on that basis, our test was highly successful. More than strictly return on investment, however, the campaign proved the validity of our model. Our next step is to use this proven model to find new prospects using D&B and other business-to-business sources. If we rent 100,000 D&B names, and score them using the model, we should come up with at least 30,000 who are high scorers. Using our methods, we should be able to sell 1,500 trucks at a promotion cost of less than $400 per truck. So we sold 160 trucks to a group of companies that the client had expected to buy only 85. 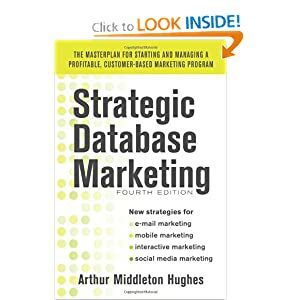 A customer database and a model can be very rewarding for those who know how to use them properly.